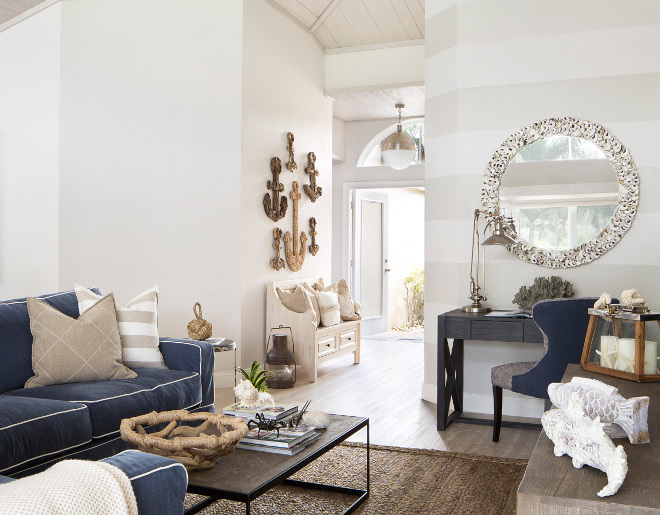 Perfectly designed by Lisa Michael Interiors, this Delray Beach FL coastal cottage is all about comfort and calmness, starting with its light hardwood floors and whitewashed wood ceiling. The designer shares her inspiration for the interiors: “What was my overall vision for this home? 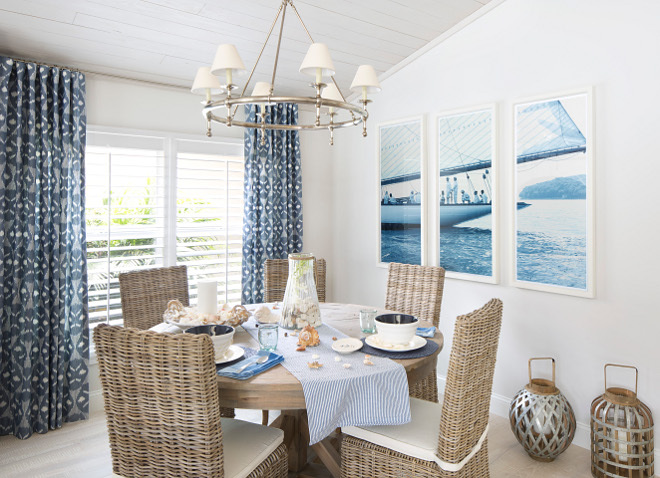 My goal was to create a vacation home reminiscent of the quaint seaside cottages dotting the shores of Cape Cod. 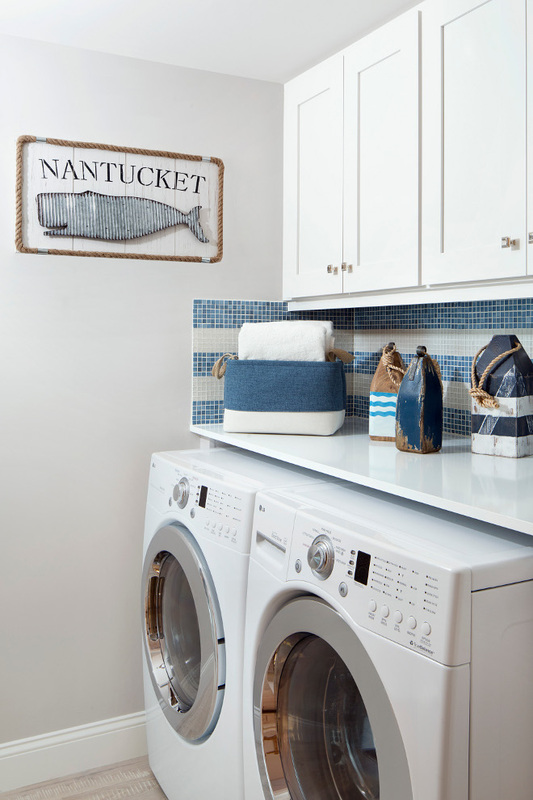 Inspired by my own time spent on the Cape, I infused the home with nautical references, classic details, and weathered finishes. 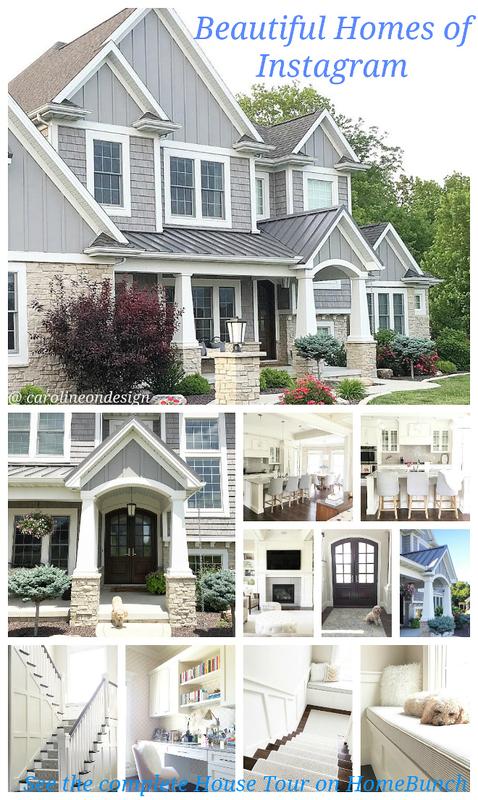 I wanted the home to be warm and inviting; while still maintaining a casual elegance. 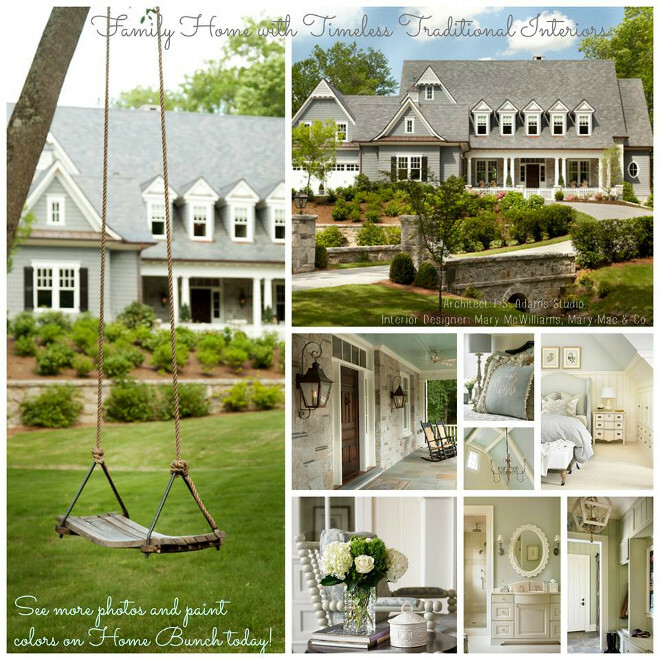 Take notes on paint colors, lighting, home decor and more sources shared by the designer. Make sure to save these pictures or pin them for future reference. 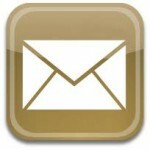 You will find some great ideas here! The foyer sets the home’s casual tone with a comfy bench and decorative anchors. 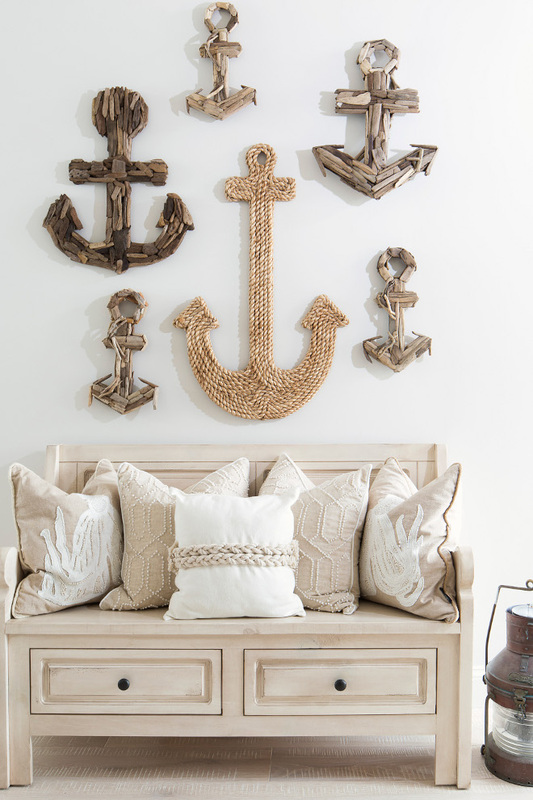 The entry bench and anchors are from Home Goods. 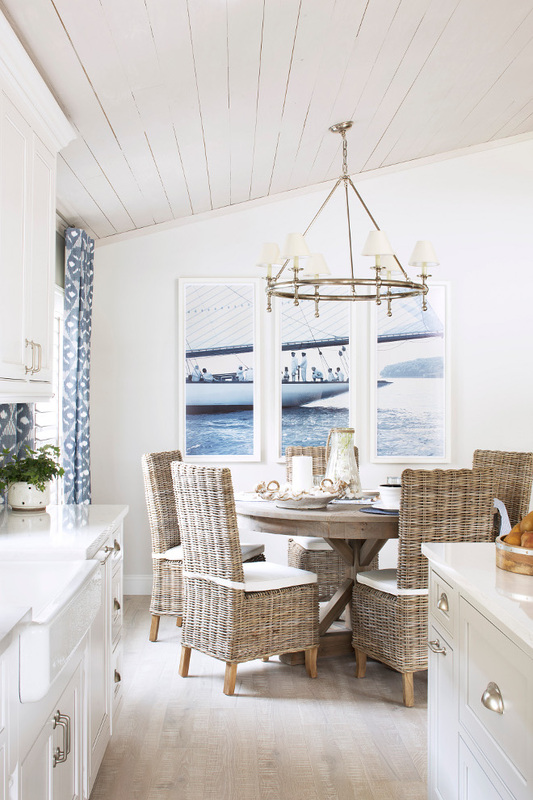 The designer added classic coastal colors to bring personality to a fairly neutral home. The paint color here is Benjamin Moore Balboa Mist with 25 percent white added AND Benjamin Moore Balboa Mist at 100 percent pearl finish. That’s what gives it the dimension. In fact, all in the main area are Benjamin Moore Balboa Mist at 75 percent. Designer Tip: If you find a paint color you love that is slightly too dark you can have it reduced by 25% of the color adding white. 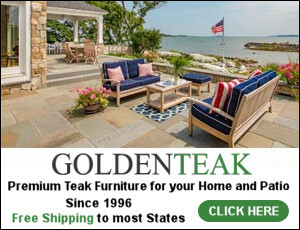 Desk was custom made by Tritter Feefer and the desk chair is by Lee Industries. Media Console, Sofa Table and Coffee Table are from Restoration Hardware. Jute Rug: ABC Carpet and Home. 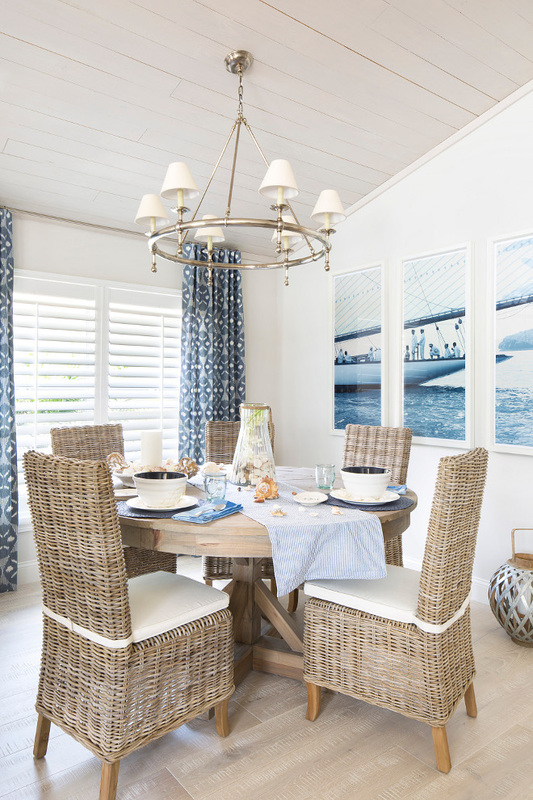 Decor is from Home Goods, Wayfair and The Boat House in Delray Beach (retail store). This completely renovated kitchen is welcoming and perfect for family gathering. Cabinetry: Cabinets are by Omega. Perimeter cabinet color is “Pearl” with “Pewter Glaze”. Island color is “Dove”. Bar stools are from Crate and Barrel. The whitewashed ceiling goes perfectly with this flooring. Floors are Mohawk Artiquity hardwood flooring. Color is Arctic White Oak. The stunning greywashed tongue and groove pine wood ceiling was hand-painted by Dana Donaty Designs for a weathered appearance. The kitchen features beaded inset cabinets. Countertops are Cambria Quartz Torquay. The marble backplash tiles are by Jeffrey Court. Faucet is by Newport Brass. Finish: Antique Nickel. Cone pendants are from Circa Lighting. Lighting is “Classic Ring Chandelier” from Circa Lighting. The reclaimed wood dining table and chairs are from ACP Home Interiors. The Ikat draperies are by Schumacher. The art is by an art company called Trowbridge. This is one of my favorites room in the house! Isn’t it incredible?! 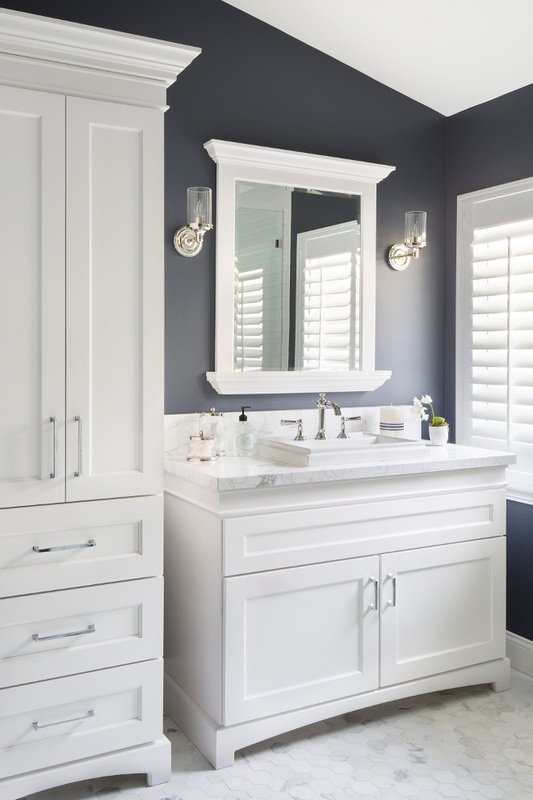 The vanity is by Kohler; color “white”. 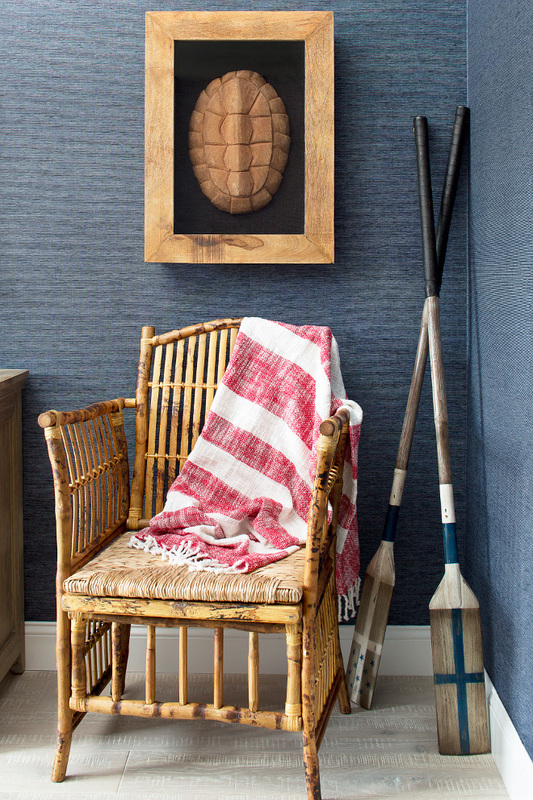 Wallpaper is by Phillip Jeffries – an extra fine arrowroot wallpaper in Denim. Floors: Lunada Bay Hexagon Glass Floor Tile in Gloss. Powder Room Hardware: The pulls are from a local hardware store in Boca Raton called Elegant Hardware. The rope mirror is from Wayfair. 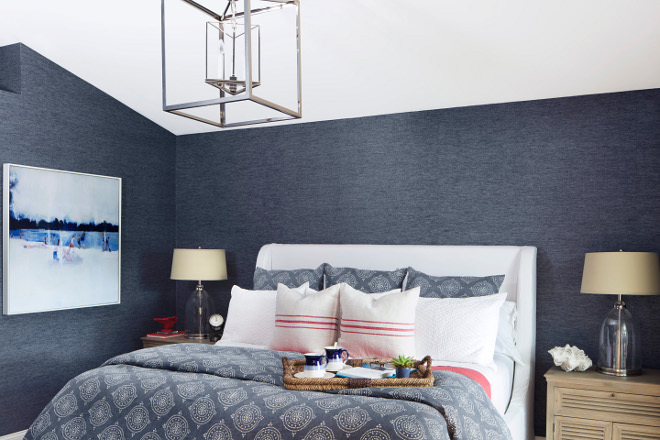 The master bedroom features a navy wallpaper; a Phillip Jeffries Blue Barogues wallpaper, which beautifully contrasts with a white upholstered bed. 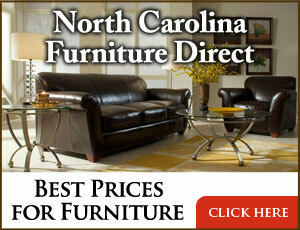 The master bedroom bed, nightstands and dresser are from Restoration Hardware. The rustic bamboo chair is from Kenian. What a great bathroom! 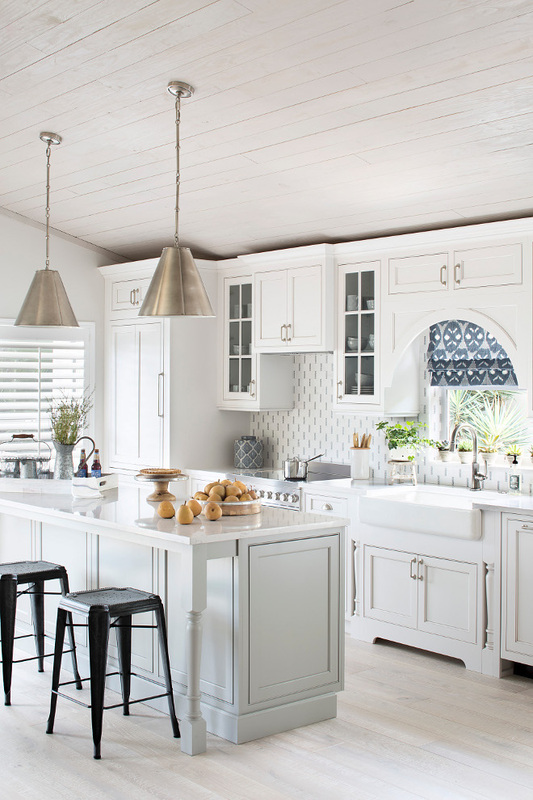 The dark navy walls really make the white cabinetry pop! Floor tiles are Hexagon Statuary marble and the shower tiles are 3 x 6 white beveled subway tiles. Paint color is Benjamin Moore Hale Navy. 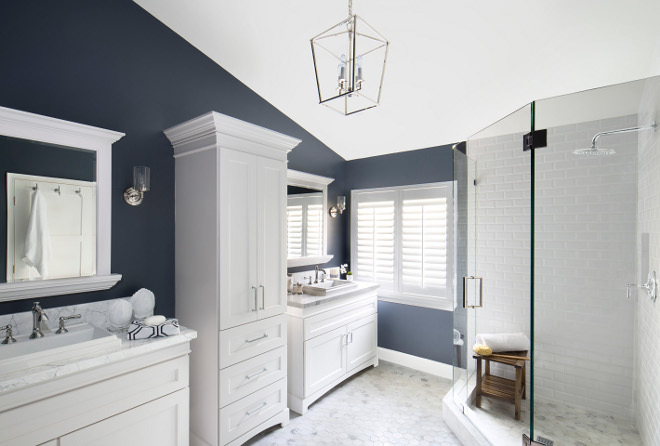 Hale Navy by Benjamin Moore looks amazing in almost any room! Interiors by Lisa Michael Interiors. Follow Lisa Michael Interiors on Facebook. This home makes me happy! I love the color palette and the decor. What a beautiful space!!! How are you guys doing? It’s being a crazy week around here.. I am working so much while trying to get everything ready for the kids to go back to school, but I have to say that I feel immensely blessed for having a husband that’s by my side for everything. He helps me with the kids and even with the house. I really could not be able to do all of what I do without him. Gratitude… we have so many reasons to be grateful for, but it always should start with the people we have in our lives. Thank you, my friends for being here today. We’ll talk again tomorrow! Sources: Interiors by Lisa Michael Interiors. Photography by Jessica Glynn. It’s beautiful, Luciane. 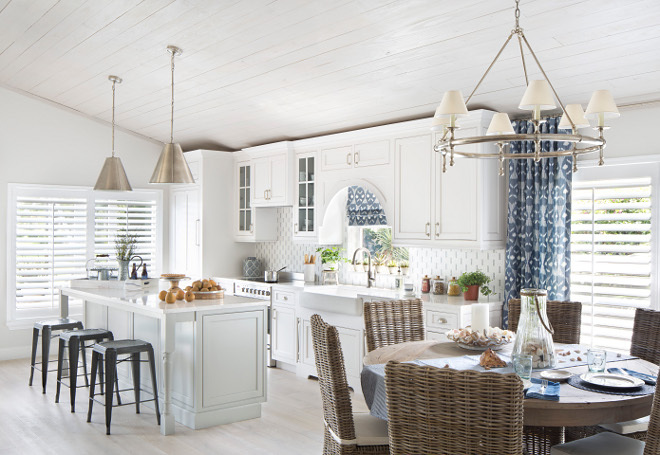 Love the ceilings and the blue grasscloth is gorgeous! Hope you’re having a great week! 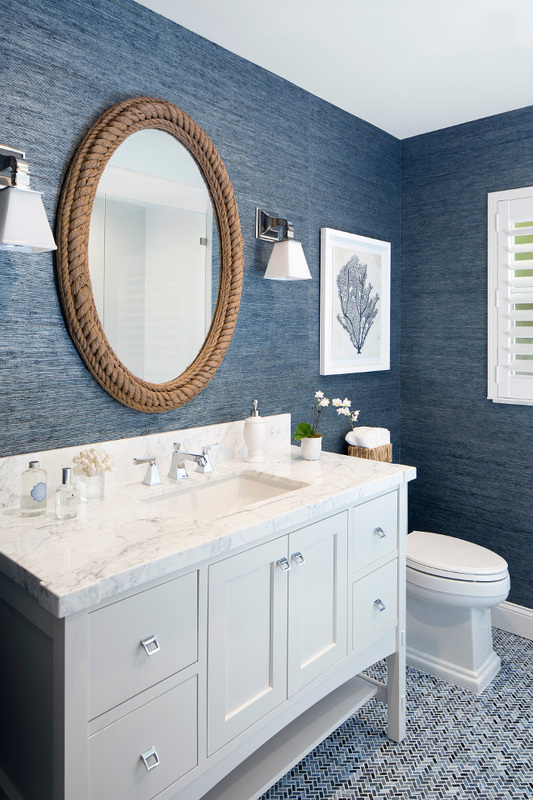 I love the blue and white and that denim grasscloth.